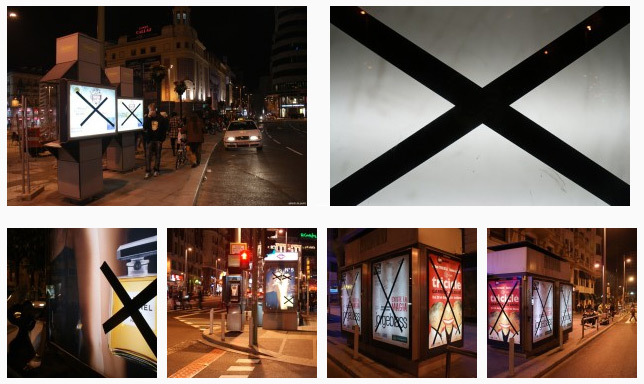 I was just emailed a tip that a second huge cross out campaign was done in Madrid, this time taking place over street furniture advertising locations. Upon further inquiry, the person who got in touch would only tell me that an "active group of urban artists from Madrid" had done this, and that they wanted to take no responsibility. At least that is the way it came off in translation. Check out the full set of images, and see the related first action which took place over billboards in June. I see that the street furniture vender, in some of the fotos (see below), is CEMUSA -- which is a Spanish company -- which I believe HQ'd in Madrid. In 2006, it was CEMUSA who won the 20-year street furniture franchise for all of the NYC bus shelters.